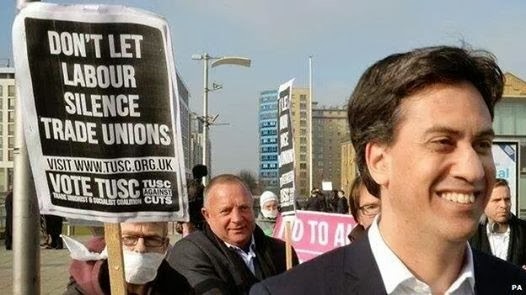 Yesterday, Ed Milliband finally cut through the last remaining threads tying the Labour Party to its roots as a party created to provide a political voice for the trade union movement. Today, Tristram Hunt went onto the Sunday Politics show to announce that a future Labour Government "won't repeal Gove's school reforms". If any teacher was in doubt, this weekend has provided further evidence that we can't rely on any Government elected after the next General Election to willingly reverse the direction of education policy. Instead, we will need to rely on our own strength to force politicians to think again. Scandalously, but not unsurprisingly, Hunt is quoted on http://www.politics.co.uk/news/2014/03/02/we-won-t-repeal-michael-gove-s-school-reforms-admits-labour as saying "I don't think you want to waste political energy on undoing reforms, that in certain situations build actually rather successfully on Labour party policy"
Meanwhile, yesterday, the special Labour Party conference voted to further dilute the ability of the affiliated trade unions to influence the direction and policies of a future Labour government. So, while most teachers rightly want to see the back of Gove, Osbourne and Cameron, this weekend will make even more question who they can vote for at the next General Election. However, these events can also help convince teachers that we have to take strike action on March 26 and beyond. 'Waiting for Labour' is simply not an option. Regrettably, I believe that the Labour Party has been fundamentally changed from the Party that I joined as a teenager to campaign for a real alternative to Thatcherism. 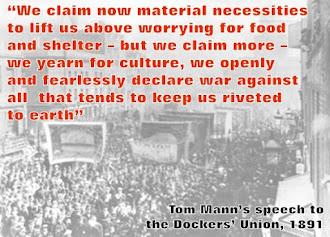 I believe that the struggles that we will have to wage in the months and years ahead will convince ever wider layers of trade unionists that we need to rebuild our own political voice. Hunt's comments make ever clearer that the Labour Party is not going to provide it.